This Unpopular 16 Colors RGB moon lamp is an epitome of the Moon, it is crafted basing on the TRUE lunar surface from NASA satellite images. Inspired by the moon, this rechargeable nigh light will more delight and content into your life. 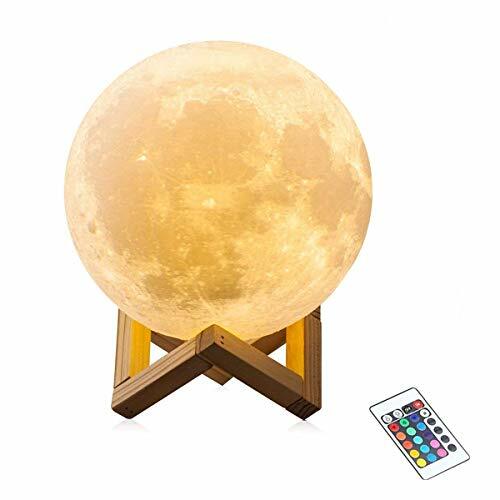 Just imagine that you are in a magical world with this moon lamp night light, and just like a real moon in your hands! And the RGB 16 Colors will give the surprise feeling, and it is good for kids night light, either. Designing without button, when full charged by USB cable, On/Off or changing colors is operated by Sensitive Touch Ring Control. 16 Colors for you to choose: Choose the colors for your mood of the day! Or you use it as a baby night light for your lovely baby. 2018 Newest Version-16 Colors moon lamp is a remote and touch control LED Lamp, including 16 color RGB, flash and fade modes. Just use use the remote control to change the color or the brightness of the color. Touch switch can only change the color and remote control can adjust the brightness of any color. The best remote control distance for the remote control is 10 feet, please note that obstacles will affect the control effect. 16 Colors RGB - White,Pink,Blue, Purple, Green, Red Multi Color and Lifelike D3 Printed Moon Texture. 8 Hours Long Lasting Rechargeable Battert - High Performance Lithium Polymer eco Battert Gives 8 Hours Batery time. Use as night light or side table ornament. Recharge your Moon Light either from socket or USB connected to your lamtop/computer. 2 hours for full recharge. Plug in to wall and use as permanet side light, or use as mobile light. The surface is vivid with a realistic touching of the detailed crater and mountainsbecause it is empowered by precision 3D technology, and exquisitely crafted according to NASA satellite images of the moon. The Lamp is odorless and Non-toxic. If you have any questions about this product by UNPOPULAR, contact us by completing and submitting the form below. If you are looking for a specif part number, please include it with your message.